We all look for something when we watch a movie. What that is differs, but usually has to do with how it speaks to us, and how long we will remember it after we finish watching it. Obviously, when it comes to horror…not a lot of films really come to mind as being spectacular, one-of-a-kind movies. They exist, but rarely. The Shining is one of those films. Based on Stephen King’s novel of the same name, The Shining brings new light to what you call a haunted house story. Blend a little paranormal cabin fever in with a haunted hotel, and you got a unique cocktail called The Shining. When Jack Torrence (Jack Nicholson) gets a new job as hotel caretaker for the winter season, he moves his wife (Shelley Duvall) and son, Danny (Danny Lloyd) up there to accompany him while he attempts to finish a writing project he has been working on for some time. While there, they are the only ones in the entire hotel. That doesn’t stop history from repeating itself, though. The ghosts of the Overlook Hotel bring a bloody past back to haunt Jack, making him more and more aggressive as the days pass. Will the same bloody outcome affect Jack and his family? I need to first bring up the book, but I swear this doesn’t affect my rating. I never read the book, but I know one thing is for certain, focus wasn’t supposed to be so much on Jack as it was supposed to be on Danny. 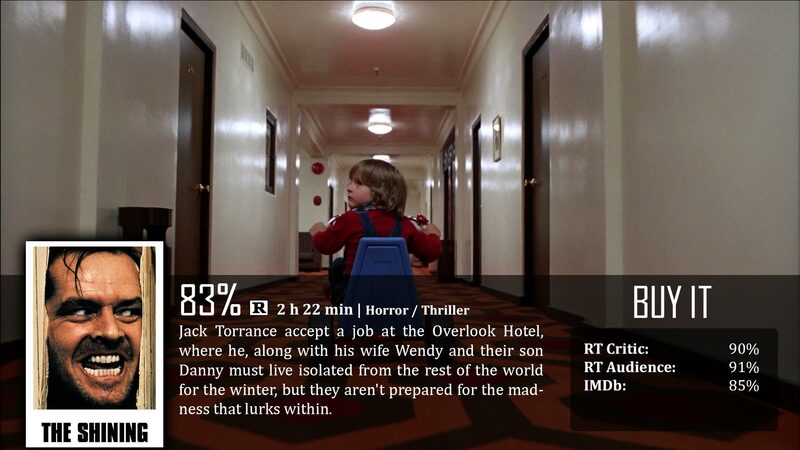 The shining in question is Danny, it’s the ability that he has. Sure, the film gets into it a little bit, but it clearly wanted to focus on Jack Nicholson’s performance as Jack Terrence, losing it scene after scene. Which by the way, if anyone were to play a crazy maniac, it was Nicholson…it was as if every scene it was testing the boundaries of how crazy Nicholson can look. Anyways. The book, from what I understand (I could be wrong), focused more on Danny’s side, and I was left really hoping to see more of his story. This is where it actually affects my rating, because as far as storytelling goes, I wasn’t sold on Jack Nicholson as being an average man. Crazy, absolutely – what a brilliant Oscar-worthy performance, average? No, not even a little bit. From the moment the film opens up, Jack Nicholson goes to an interview for the position…and well, I wouldn’t hire him. He had that murderous look in his eyes, and that sadistic smile. I was literally waiting for him to kill someone in the first twenty seconds of seeing him. Maybe that’s just Nicholson, maybe that’s just history of knowing how his roles typically go…but I just wasn’t sold. Thankfully, it doesn’t take long for his character to genuinely be crazy. As for the other performances, they were okay. I wasn’t as fond of Shelley Duvall’s performance as Wendy, but others may respectfully disagree with me. I just found it really tacky, I didn’t see the chemistry, and I just think her ability to act itself could have been a lot better, but once the film gets into the tense moments, you don’t care anymore, which does help. This is a horror film that sticks into the back of your head and nestles there. For that reason, I give this film a stamp of approval. That’s what they are supposed to do, this was able to benefit both off of visual stimuli as well as suspense and the unknown. As far as the visual stimuli goes, you can tell this sucker is a work of Stanley Kubric’s, that man is a visionary. Even the eerie sounds accompanying the scenes feel very much like a Kubric film. There are plenty of purposefully slow-moving scenes, like creeping up on a slightly open door. What happens? Your mind begins to postulate what’s behind it, and it gets scared before the thing that’s supposed to scare you even shows up – that’s brilliant craftsmanship. The Shining may not follow the exact routine of the book, but it makes it its own for a very memorable horror film watching experience. Still scary after all of these years. And yes, even despite all of the conspiracy theories people have about this flick. Good review Dave. The only problem was that, apart from Jack Nicholson being absolutely brilliant as a maniac, he still looked like a killer from the moment the film begins, and from what I gather, his character is supposed to be rather ordinary, slowly turning mad. I should have took a picture, but in that interview in the beginning, Jack gives this look after saying, “Well that’s not gonna happen again” (referring to the past murder). His look was clearly supposed to be innocent, but I swear he was about to burst out and kill everyone in that room then, haha.